Crab Cakes – One Half Indian. 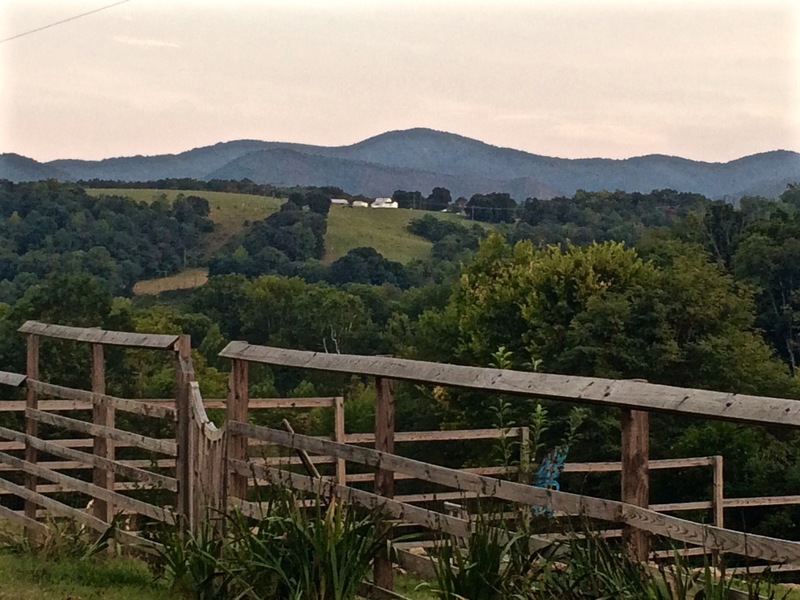 Last weekend we went to the mountains in Virginia for Labor Day. We stayed on a beautiful farm that was close to lots of trails and hiking. I fulfilled one of my long time goals of hiking on the Appalachian Trail. 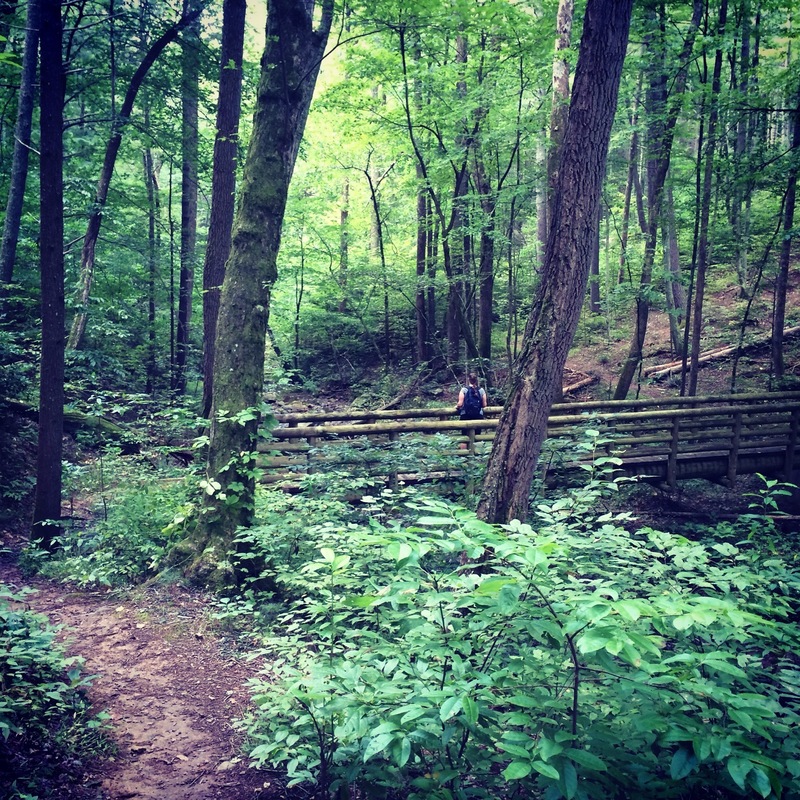 The trail was beautiful and scenic; I hike I will remember for years to come. 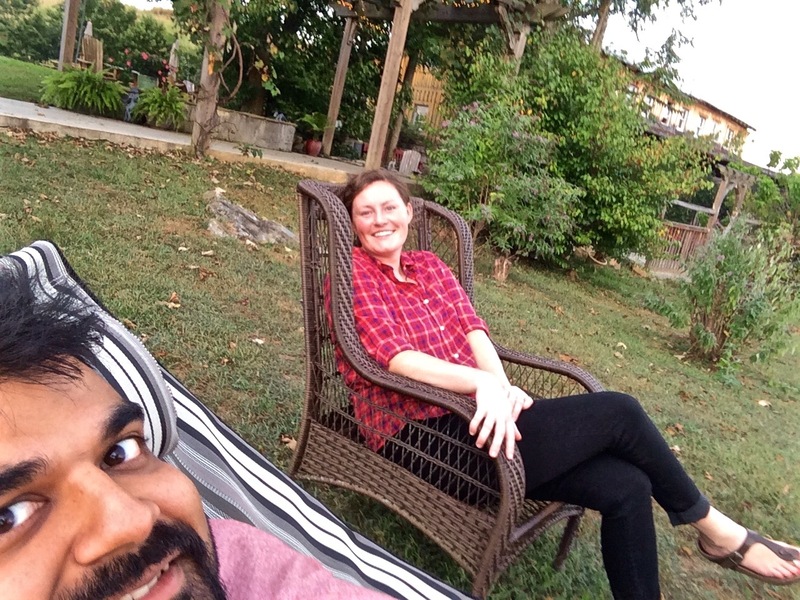 The whole weekend was simple and relaxing (which is just our style). I loved having a break from TV and internet. Instead of being plugged in, we spent our time playing outside and playing Scrabble, Boggle, or 20 Questions. The food was simple and camp style, which was great for the weekend. By the time we were home though, we ready for some quality home made food. Thus, crab cakes were born. When my husband and I first met, one of the first things we bonded over was food. Well, Pennsylvania (I am from Pittsburgh and he went to grad school at PSU), then food. One of the first recipes we made together was crab cakes, so this recipe is kind of sentimental (is that possible? can recipes be sentimental? I am turning into my mom…). It’s pretty simple to make; but you have to shell out some dough for the crab meat. We get our crab meat already shelled and from Whole Foods. Even though it is expensive, this is a recipe we make maybe once a year and in a small portion, so we don’t feel super guilty about it. 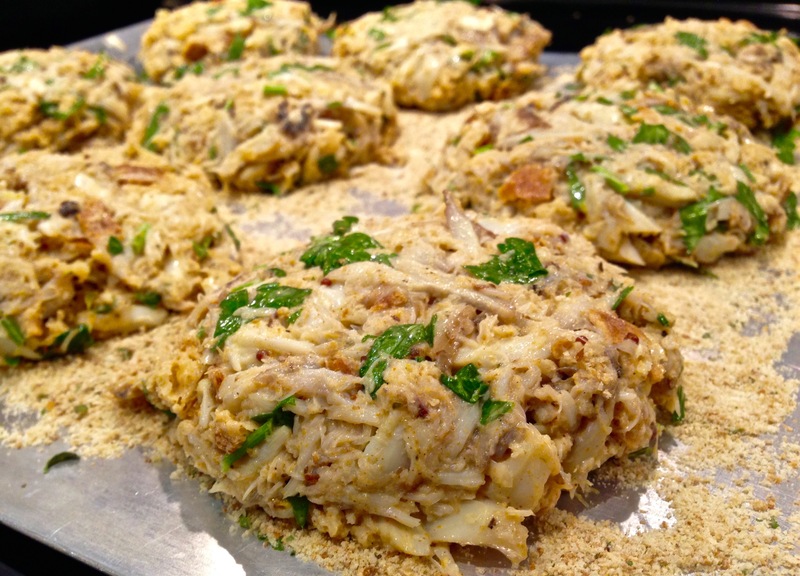 Plus, it’s a delicious crab cake that tastes like the ocean in your very own kitchen!! Can you really put a price on that? I think not. Crab Cakes Ready to Eat! 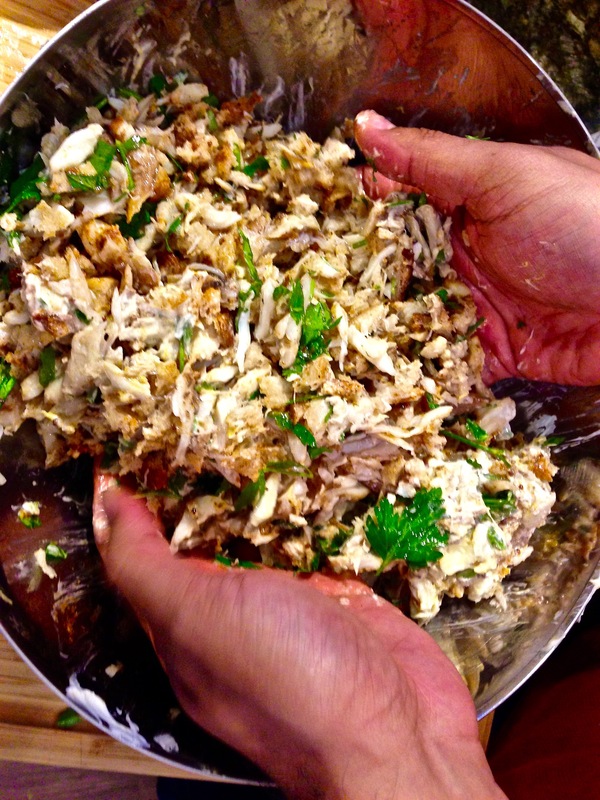 Crumble crab meat in a bowl. As you crumble, remove shell. If there is a lot of liquid with your crab meat, put it in a strainer for 5-10 minutes and let the liquid run out. 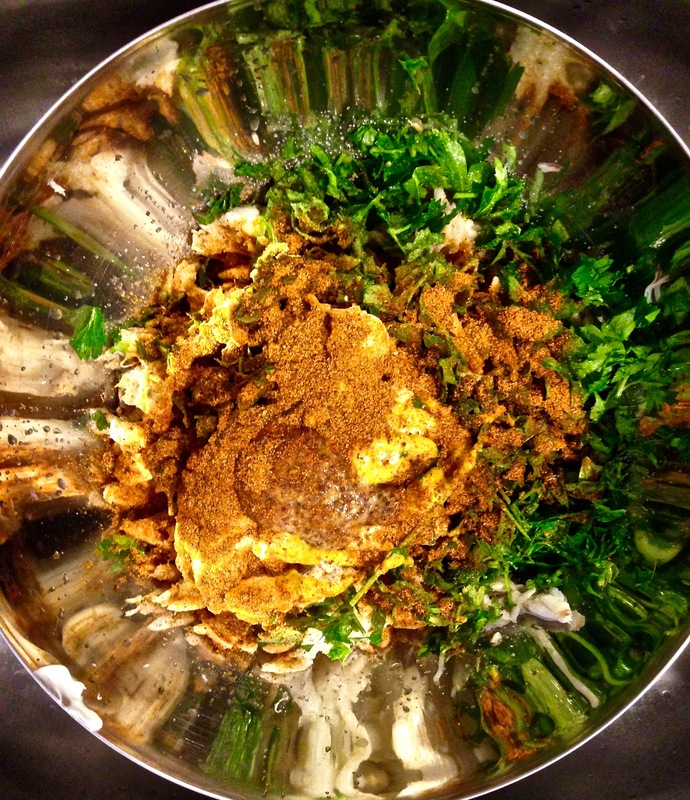 Add bread crumbs, lemon juice, parsley, mayo, old bay, tamari, eggs, salt, mustard, and some black pepper to the bowl of crab meat. Mix with hands. Be careful not to break down crab meat too much. If you are only using lump crab meat, it will break down some, and that’s okay. After mixing all ingredients, form into balls in your hand, and then place on a tray or baking sheet. Flatten the balls into patties. We make large patties, about a 3 inch diameter, but anywhere from 2 – 3 inch diameter patties is fine. Our patties were about 3/4 inch thick. After forming the patties, place the tray in the fridge. Let the patties rest for minimum 2 hrs in the fridge. If you are in a rush, you could put the patties in the freezer for 30 mins. Optional: You can place some panic bread crumbs on the outside of the patties before putting in the fridge. This will give the patties an extra crust. 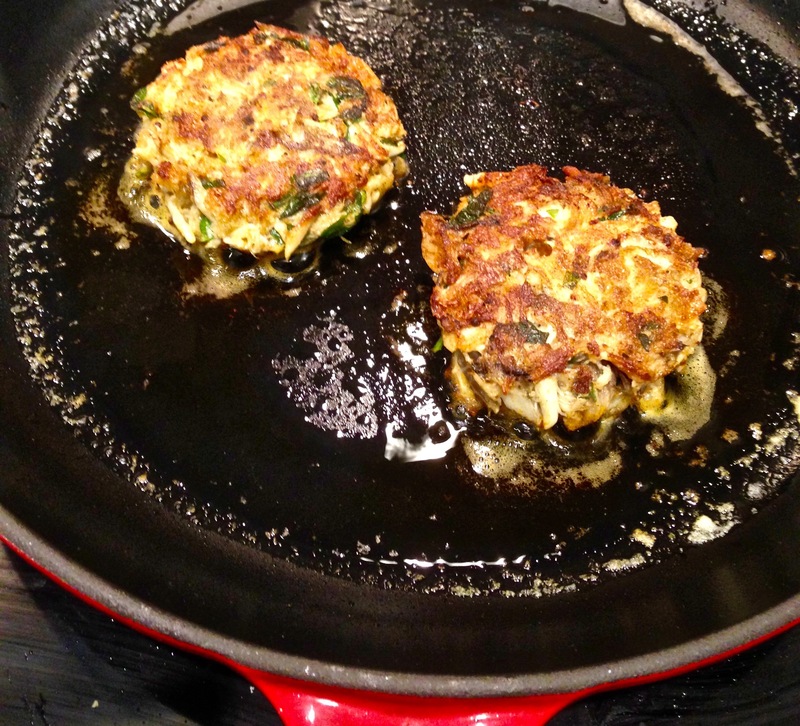 When you are ready to make the crab cakes, heat a heavy bottom skillet on medium heat. Melt a mixture of butter and olive oil in the pan. Cook the cakes in batches being careful not to overcrowd the pan. Cook for 5-6 minutes o each side or until a nice golden brown crust forms. Optional: Dust some paprika onto the top of the crab cake before cooking. 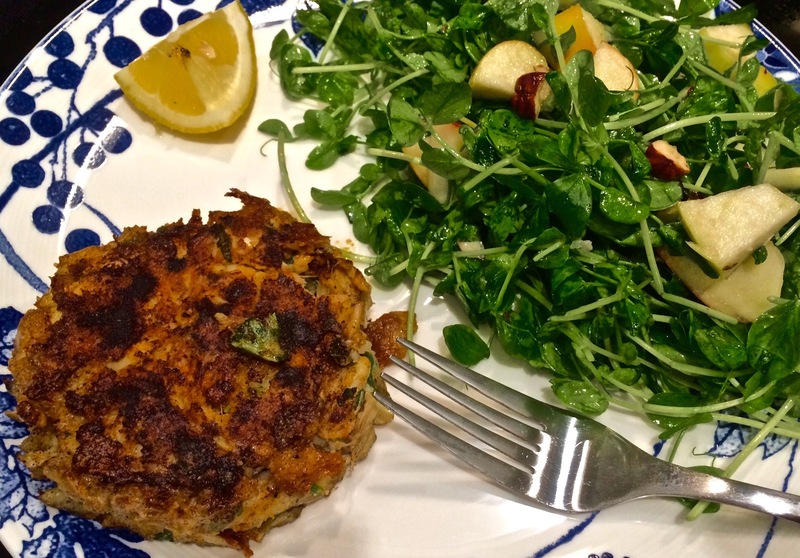 When the crab cakes are done, serve with greens and a lemon on the side.